Iraq's new police force is facing mounting allegations of systematic abuse and torture of people in detention, as well as allegations of extra-judicial killings. The minority Sunni community in particular claims it is being targeted by the Shia-dominated police force. The traumatised face of Dhai Adnan Saleh stares from the podium at the journalists and cameramen in front of him at a hastily convened news conference in Baghdad. Surrounded by a forest of microphones, this tall, thin, awkward man begins mumbling a statement from notes scribbled on a sheet of paper. He tries to compose himself and starts again. This time, he describes the horror of the past 24 hours from memory - a memory which is certain to haunt him for the rest of his life. Dhai Adnan Saleh is both extremely lucky and extremely brave. He is one of very few survivors of a mass killing by police commandos and he has dared to speak publicly about what happened. He and at least nine other relatives - all Sunni Muslims - were detained earlier this month, apparently because they were suspected of being insurgents following a shoot-out in their area. "We were left from 5.30 that evening inside a kind of container that had no air vents. After one hour, we lost consciousness and some people began to die, the others were dead by one o'clock in the morning." The other survivors who were in a serious condition were treated at Baghdad's main hospital under heavy guard by police commandos. The BBC was not allowed to speak to them and was not allowed to enter the morgue where the bodies were kept. And shortly after the BBC team arrived, the security forces took the survivors away. One hospital doctor who did not want to be named said medical examinations showed signs of suffocation. And he added: "One of the patients told us he complained of electrical shocks, multiple electric shocks." While the government says it has suspended the police officers believed to be responsible, the BBC has obtained evidence that this was not an isolated incident. Within days of Dhai Adnan Saleh speaking out, we tracked down another man in Baghdad who told us he had just survived a very similar ordeal at the hands of police commandos. The man was too frightened to give his name. As in the earlier case, he told us he was part of a large group of men who were rounded up following an insurgent attack on the security forces in their district. He described how the police sealed off the neighbourhood and broke into their houses, arresting any men they could find even though the body of the insurgent was lying on the road along with his identity cards and mobile phone. After interrogation overnight came the most terrifying part of their ordeal. "We were told to get in the back of a strange vehicle," he said. "It had no air vents at all, no windows. The brigade commander came, insulted us and closed the door. "We became hysterical, kicking the inside and shouting: 'Get us out or we'll die!' They allowed us to suffocate for a few minutes and then opened the door and asked us: 'Have you seen death?' They repeated this more than five times. We were very close to dying." This particular technique of torture and killing is a new one to add to an already long list of other forms of torture of which the new Iraqi police force stands accused. The video shows the body of a Sunni Muslim preacher being washed for burial. His supporters say he had been picked up by police commandos for allegedly being linked to the insurgency. The camera focuses on marks all over his body including what appear to be drill holes. According to Salman al-Faraji, a human rights activist and lawyer, the use of drills is common. "Most cases are quite similar, the same methods are used," he said. "They torture them, breaking hands and legs. They use electric drills to pierce their bodies and then the killing is carried out at close range." We made repeated requests for an interview with the minister of the interior or his subordinates to respond to all these allegations. But no-one would speak to us. In a statement following the first suffocation case, the minister said he would not allow any members of the police involved in human rights violations to walk freely without being punished properly. He also promised that investigations would be swift and comprehensive. But a source inside the ministry dismissed this statement saying the promise of an investigation was "for the media only". The return to torture and killing by the security forces is another embarrassment for the American and British governments, which have partly justified the invasion of Iraq on the grounds of ending the kind of abuses committed by Saddam Hussein's regime. A senior Western source in Baghdad admitted he was worried about the police commandos who are particularly involved in counter-insurgency operations. 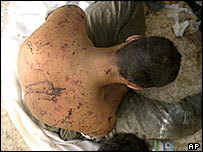 "They can be effective," he said, "without torturing or abusing detainees". But he added "it was a big task" to create a clean police force given the nature of the previous regime. What is also a major concern is that the minority Sunni Muslim community who used to control Iraq believe they are now being deliberately targeted by the Shia-dominated police force. The insurgency is led by militant Sunnis whereas the government is now led by the majority Shia. In their brutal campaign of violence, the insurgents have focused their attacks on Shia and members of the Iraqi security forces in order to provoke sectarian conflict. If the security forces respond with torture and extra-judicial killings, it could lead to exactly what the insurgents want - full-blown sectarian war.